We have all been in that place, wherein we wanted to lose weight, take a walk in the woods or maybe just go running or cycling. How did that go for you? It never worked out for me at-least until, I found the magic of some health and fitness apps. Now, you all must be enthusiastically wondering about those apps, if I’m not wrong? So, let me throw some light on those wonderful apps, without a seconds delay. 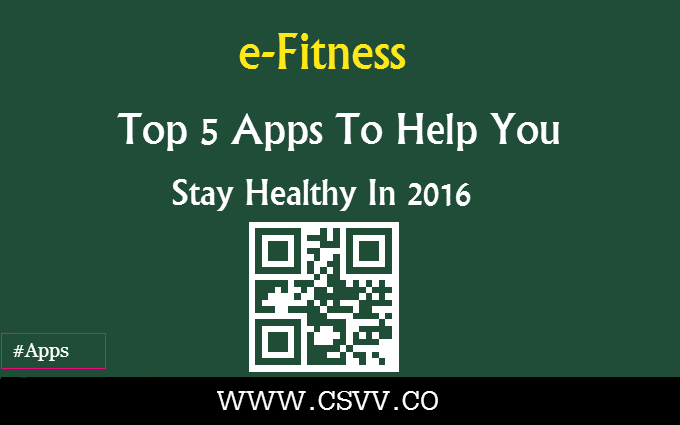 Below, you’ll find some wonderful apps to help you stay healthy in 2016. Try them out and tell your family and friends all about them. Enjoy! Workout trainer is one of the top apps for exercise. It contains thousands of free workouts with custom training programs, which can help you achieve your fitness goals this summer. This app is ideal for those people who want to get in shape without any exercise equipment’s. They have a variety of areas to offer, from which you can choose a particular field to focus on. Like, weight lose, to get six pack abs, ways to improve your running, practice yoga and many more. It is the perfect fitness companion you can ever ask for. If you are a running or a cycling enthusiast, this is the app for you. Runners and cyclist use this app to keep a record of their activities and compare them over time. It actively tracks during and after an activity stats like distance, pace, speed, elevation gained and calories burned. It provides you with an interactive map of activities in the end. It is also a fun app, where you can share you stories, highlights of your activities and achievements with your friends. Keeping the challenge lovers in mind, they have specially designed monthly challenges to push you further. Isn’t that perfect? This app gives you an opportunity to choose from 27 different sessions of different lengths and difficulty levels. Pocket yoga gives you a detailed voice and visual instruction guide to help you through every pose that’s given, with inhalation and exhalation tips. It also maintains a log of your yoga practices to track your progress. And, the best part about it is, this guide is specially designed by experienced yoga instructors. So, you can practice yoga at your own pace, in the comforts of your sweet home, with the music you love. StrongLift is like having a personal trainer by your side, for the strength and muscle-building. It is the simplest and one of the most effective workout to build stronger muscles and to burn fat. The app efficiently guides you through every workout. It lets you know which exercise to do, with how much weight, for how long to rest between sets and many more. It has a very simple, easy and intuitive design, add-free! Whether you workout or not, and yet like to keep a record of your calorie intake. You will love this app, as much as I do. It will help you keep a track of not just only your diet but also the exercises. It takes less than 5 minutes a day to enter the details. It remember’s your favorites and add multiple foods at once, this makes it easier and faster to use. And, they also let this app connect with over 50 other apps, like Strava, Fitbit and many more, to keep it automatically updated. Recent studies shows that, people who use fitness apps to help remain healthy and on track everyday are healthier than non-users. Plus, they are beneficial to all age groups. It provides you the accurate heath and fitness tips and keeps you motivated by tracking your progress. So, don’t wait to download these apps, they can change the way you look at life!